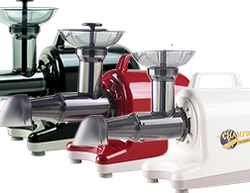 In Stock Due to slow sales and high customer dissatisfaction, we have discontinued all champion juicers. We do offer many other juicers that we feel are superior to the champion. has been redesigned to work better than before while maintaining the lasting durability that owners of Champion Juicers have known and loved for over 60 years. The Champion 4000 Juicer is the answer to every juicing problem. Because it operates on the mastication process, the Champion 4000 Juicer chews the fibers and breaks up the cells of vegetables and fruits. This give you more fiber, enzymes, vitamins and trace minerals. This all results in the darker, richer color of the juice and a sweeter, richer more full-bodied flavor. As more value is extracted from a vegetable, more pigments or color are also extracted. This is why Champion 4000 prepared juice is darker and richer in color when compared to that of a conventional centrifugal-type juicer. This is true whether it is carrot juice, mixed vegetable juice or straight chlorophyll juice such as parsley juice or turnip leaf juice. You can also see it in the Champion-extracted pulp; it is pale in color. The difference in quality is also apparent in taste. Juices extracted by a Champion 4000 Juicer are richer and offer a more full-bodied flavor. Designed for simplicity, the Champion 4000 Juicer doesn't require nuts, bolts, screws or clamps to assemble. The floating cutter just slides on or off the shaft; a quick half-turn and the body locks on or releases for removal. By changing a few parts of the juicer, it transforms into a homogenizer. In addition to extracting vegetable juices, the unit can make coconut milk, baby foods, fruit sauces, nut butters, ice creams and sherbets. No other juicer can do this. Powered by a full 1/3-horsepower, heavy duty General Electric motor, the Champion 4000 Juicer is powerful, durable and built to last. All Champion 4000 juicer parts are made from 100 percent FDA approved plastic and are BPA-FREE. Large Feeding Chamber - 2 1/4 inches in diameter, able to take large vegetables without cutting them into smaller pieces. Floating Cutter - designed to separate the juice from the pulp in a continuous operation. No intermittent cleaning required. Tempered Stainless Steel Cutting Blades - the blades are cast into the cutter for strength and durability. They never separate, rust, twist, tarnish or easily become dull. Get a FREE Juicing Bowl with your purchase of the Champion Juicer. The Champion BPA-Free juicing bowl is specifically designed for use with the Champion Juicer to catch the juice or pulp. It also can be used as a 1-quart measuring cup. What's the difference between the Champion 2000 and Champion 4000? Size of Feed Chute 1.75" 2.25"
The 4000 Model is the Upgraded model and can do everything the 2000 model can do and more! Turn your favorite vegetables such as Carrots, Celery, Parsley, Cabbage, Spinach, Kale, Tomatoes, Bell Peppers into a delicious green vegetable juice. Turn your favorite fruits such as Pineapple, Watermelon, Oranges, Apples, Pears and more into a sweet fruit juice perfect to cool off on that hot summer day. The all-new Champion 4000 makes Nut Butters better than any other juicer due to its high speed grinding that helps the nut butter to congeal better than slow juicers. 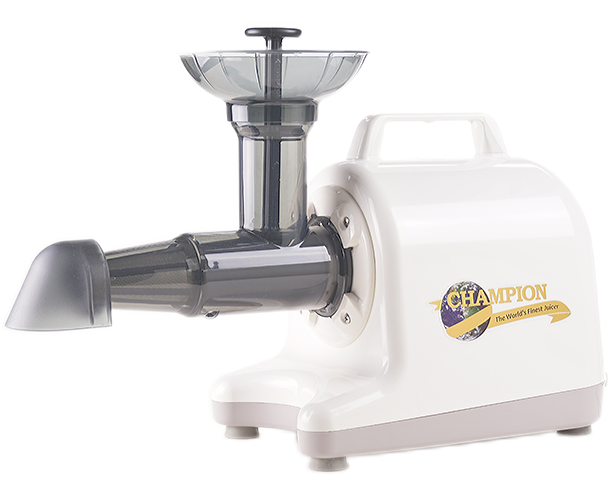 With the Champion 4000 you can turn frozen bananas into 100% fruit sorbets aka Ice cream without any milk products. This "ice cream" is the healthiest you can eat without any additives or preservatives. The champion makes the best frozen fruit sorbets compared to other juicers due to the high speed blade that whips up the frozen fruit as it is processed. With the Champion 4000 and the included blank attachment you can make Fruit Sauces, Baby Foods, Purees, Salsa and More! 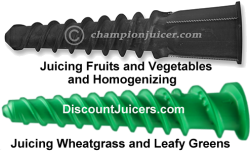 With the included green auger your champion 4000 turns into a wheat grass and leafy greens juicer. It will also more effectively juice sprouts and other leafy green vegetables than the black auger that is designed for juicing and homogenizing fruits and vegetables. They are all the same price have have the same specifications. Please click the color to be taken to the web page to purchase.